Singer and Magic Malta presenter, Amber, is also being portrayed in fake advertisement that she made big money with a financial opportunity through an investment in bitcoin. On social sites, Amber wrote that she doesn’t have millions of euro and warned whoever watches the advertisement to report it. She posted the photos of the fake adverts that are appearing with her photo to give the impression that she is a millionaire. 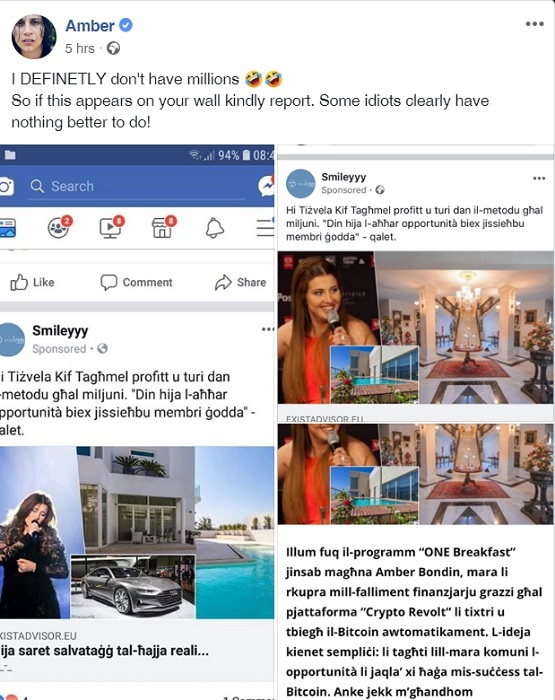 Amber is among a number of Maltese personalities which ended up being used in fake advertising recently. Singer Eleanor Cassar, actor Davide Tucci and the Maltese-Australian millionaire Alex Vella were among those who were used in the fake advertisements.